Shipping and Return Policies of Pelham Grayson Inc.
OUT OF STOCK ITEMS - ITEMS OUT OF STOCK WILL NOT BE CHARGED . WE DO NOT BACKORDER ITEMS FOR ANY REASON. PLEASE CHECK THE WEBSITE AND REORDER WHEN THE OUT OF STOCK ITEMS BECOME AVAILABLE. PROMOTIONAL OFFERS- FREE SHIPPING OFFERS , COUPONS , SPECIAL DISCOUNTS ETC ARE OFFERED FROM TIME TO TIME. YOU MAY ONLY APPLY ONE PROMOTIONAL OFFER FOR EACH ORDER. OUR 1ST ORDER 10% DISCOUNT MAY ONLY BE USED ON YOUR 1ST ORDER - USE OF THIS COUPON FOR ALL SUBSEQUENT ORDERS WILL BE DISALLOWED WITHOUT NOTICE. PELHAM GRAYSON WILL SELECT THE MOST ECONOMICAL METHOD OF SHIPPING VIA UPS , USPS OR LTL TRUCK SHIPPING. PELHAM GRAYSON ACCEPTS INTERNATIONAL ORDER . FOREIGN ORDERS MAY TAKE UP TO 3 WEEKS FOR DELIVERY. ORDERS WILL BE SHIPPED BY USPS OR FEDEX ECONOMY ONLY . WE WILL ALWAYS CHOOSE THE LEAST EXPENSIVE METHOD OF SHIPPING . ALL ORDERS MUST BE PREPAID ON OUR WEBSITE VIA A MAJOR CREDIT CARD . DAMAGES OR CLAIMS OF ANY KIND MUST BE CLAIMED WITH THE SHIPPING CARRIER. PELHAM GRAYSON WILL NOT BE RESPONSIBLE FOR MISSING OR LOST PACKAGES , FOREIGN CUSTOM DUTIES , OR ANY ADDITIONAL SHIPPING CHARGES OF ANY KIND. YOU WILL RECEIVE VIA EMAIL SHIPMENT NOTIFICATION A COPY OF YOUR COMPLETED INVOICE WITH ALL CHARGES AND YOUR TRACKING NUMBER FOR EITHER UPS OR USPS ( SORRY LTL TRUCK TRCKING NOT AVAILABLE). CREDIT CARD PAYMENTS THAT ARE REJECTED OR DECLINED WILL BE CHARGE A SERVICE FEE OF $10 WHEN YOUR ORDER IS SHIPPED. Return Policies of Pelham Grayson Inc..
GOODS MAY BE RETURNED FOR REFUND for any reason. You will be issued an RMA # YOU MUST HAVE YOUR INVOICE COPY WITH YOU WHEN YOU CALL FOR A REFUND. Returns must be authorized by phone only within 5 days of receipt of goods. 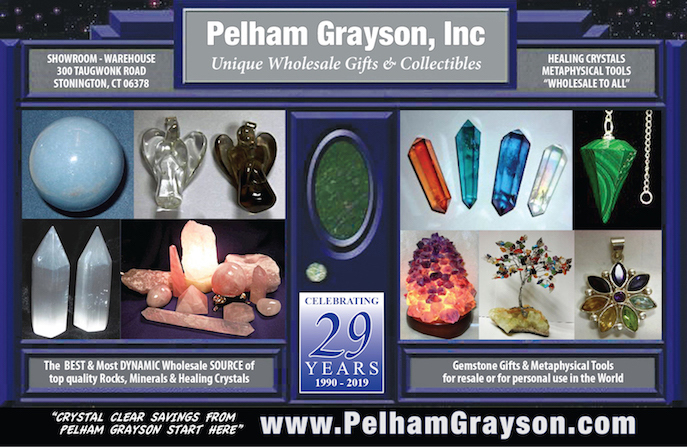 Pelham Grayson Inc. will not pay for return postage costs for goods reurned for refund. You will be responsible for all shipping expenses. The RMA # must be clearly marked on the outside of the box and a copy of the invoice placed inside the box. Refund returns will be accepted only within 21 days of receipt of goods. Goods must be returned to Pelham Grayson Inc. , 300 taugwonk Road, Stonington, Ct. 06378. Shipments returned without authorization will not be accepted. Pelham Grayson Inc. will not accept notification of returns or refunds by email or by fax. You must call 860-535-1166 for your RMA authorization. MISSING MERCHANDISE - YOU MUST CALL TO RESOLVE THIS PROBLEM. DO NOT EMAIL OR FAX WITH THIS PROBLEM. Pelham Grayson Inc. will make all refunds within 15 days of acceptance of the return and reserves the option of method of refund. FAILURE TO FOLLOW THE ABOVE INSTRUCTIONS WILL RESULT IN A REFUSAL OF YOUR CLAIM OR RETURN.